Scientists who’ve studied our distant cousins the chimpanzees believe they know the reason we humans smile and laugh. These behaviors are mechanisms for socialization, ways of fitting in, of showing others you mean no harm, that you’re an okay guy, part of the group. We’ve all heard about budding comics who learned to deflect bullying by making the bullies laugh. When we laugh we feel good, and we like people who make us feel good. I can tell you that I was one glum, anti-social chimp as I sat through “A Million Ways to Die In the West.” My wife and I split up that weekend, which is to say, we saw separate movies. The Western comedy opened on the same weekend as “Maleficent.” The studios behind both films balked at previewing them for critics, usually a sign they’ve sired an ugly pup they’re not very proud of. So, I went to “West” while she saw the Disney film, agreeing to compare notes later. I have seldom spent such a miserable afternoon in a theater seat, although I did feel good about throwing myself on the grenade for my wife’s sake. Not that there aren’t some nice things worth saying about the film. There’s more attention to lighting and photography than we expect from a comedy, and served up with Joel McNeely’s spacious and bustling score, it evokes memories of sun-drenched Technicolor Westerns of the 1950’s and early 1960’s. Charlize Theron proves once again that she can do no wrong in any role. Wes Studi manages to be both noble and funny while not speaking a word of English. Giovanni Ribisi continues to be amusing even when the scenes he’s in have long since fallen flat, and Amanda Seyfried, Neil Patrick Harris, and Liam Neeson are tremendously good sports. While I wholeheartedly agree with Seth MacFarlane’s view of the American West as a time and place full of hardship, misery and death, I can think of few other directors who would use that premise as a springboard for zany comedy. McFarlane is currently a specialist in presenting material so incredibly tasteless that an audience’s only options are to laugh or leave the theater. I get the feeling he doesn’t care which option you choose. Those of us who feel slightly embarrassed to realize that our great-grandmothers wed at fourteen, get the joke when Charlize Theron excuses her marriage to gunslinger Clinch Leatherwood (Liam Neeson) by explaining that she was only nine at the time. You know, she didn’t want to turn into one of those 15-year-old spinsters everyone feels sorry for. Okay, I did smile at that one. When the hero takes his new lady-friend to the fair, we watch a game being played that is so unashamedly, jaw-droppingly offensive that, so help me, the audience is nearly forced to double over with laughter. It’s the same reaction prompted by a thrill ride which you’re half-afraid might throw a gear and kill you at any moment. By the way, that ugly scene has one of the funniest post-credit-sequence payoffs ever. Unfortunately, the closing credits are pretty late in the game to play your best hand. I laughed here and there, but I had to run out and see “Maleficent” immediately to get the rancid taste of “A Million Ways to Die In the West” out of my mouth. Fortunately, “Maleficent” turned out to be surprisingly delicious. Amanda Seyfried does elicit smiles, if not laughs, in the MacFarlane Western when she announces that she won't hurry into marriage, now that people are living to be 35 or so. This is a comedy and her line is a comic exaggeration, but not an outsized one. Average life expectancy then was more like 45. I thought about her line last week, as I typed up the story of a pair of young friends shooting out the lights on Santa Fe No. 7 as it pulled out of Lovewell station one night in 1891. I left out parts of the Wichita Beacon article on Stephen Lovewell’s confession to the deed, because it contained something that struck me immediately as an anachronism. The Beacon writer had Santa Fe detectives wondering if the shooting might have been the work of the James brothers. I checked the dates to be sure Jesse James was long-dead and Frank James was long-retired from the train-robbing business in 1891, but I was surprised at Jesse James’ youth when he died. He was 34 when Bob Ford assassinated him for the reward money as the weary outlaw leader straightened a picture frame. Jesse was hoping to pull one final bank job and then retire. At that young age he should have been assured a full decade of golden years. His brother Frank was 38 when he turned in his pistol and took his place in a cell awaiting justice. 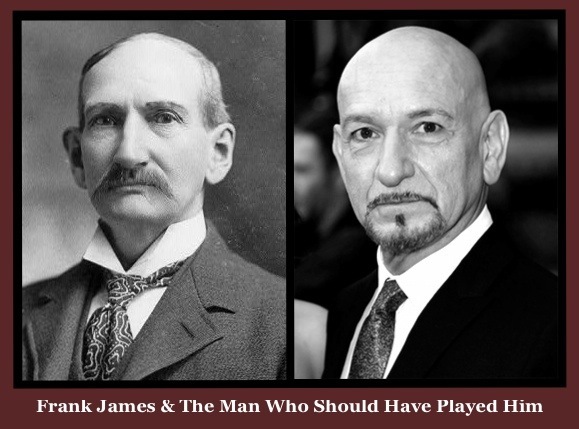 Photographs of Frank suggest that Sir Ben Kingsley would be a much better match for the role than Henry Fonda was. Jesse James was the rock star of outlaws, so it’s completely fitting that Brad Pitt was the latest actor to play him on the big screen, although he was about a decade older than Jesse was at the time of his death. Sam Shepard, playing brother Frank, was over twenty years older than the real Frank, but the extra years allowed him to exude a convincing gravitas in “The Assassination of Jesse James by the Coward Robert Ford.” However, since Sam Shepard and Ben Kingsley were both born in 1943, we all know who should have gotten the role. Wild Bill Hickok was 39 when he was shot in the back at a poker table in Deadwood. In 1970’s “Little Big Man” and 2004’s “Deadwood” he was played, respectively, by Jeff Corey and Keith Carradine, when each actor was in his mid-50’s. Wyatt Earp was 33 when he marched with his brothers and Doc Holliday to arrest the Clantons and McCaurys on the streets of Tombstone. Doc was 30. Jason Robards was 45 but looked ten years older than that when he played Holliday in “Hour of the Gun,” and 48-year-old Will Geer (Grandpa Walton!) played Earp in the classic Jimmy Stewart Western “Winchester 73,” set in 1876, when Wyatt Earp was in his late 20’s. It’s little wonder that we develop a notion that Western outlaws and lawmen were older than they really were. But men wanting to make a name for themselves in the West had to strike early, because, as Seth McFarlane rightly points out, there were about a million things waiting to kill them.